In The New Rules of Lifting for Abs, Schuler and Cosgrove deliver more than the standard bunches-of-crunches approach to abdominal training. Although building those ab muscles is important-no question-Schuler and Cosgrove also help you understand that doing so is useless in isolation. That's why The New Rules of Lifting for Abs offers a full-spectrum conditioning system designed to get you stronger, leaner, more muscular, and more athletic. Within each workout, you'll get: * Dynamic warm-ups to help awaken and activate your muscles * Core training to build balanced stability, endurance, and strength in your abs, lower back, and hips. * Strength training to increase your strength, power, and muscle mass. * Metabolic work to burn fat and improve your overall conditioning. Debunking myths and focusing on the moves and techniques that burn fat, The New Rules of Lifting for Abs will have you shedding fat, building muscle, and showing off your lean, athletic midsection faster than you ever though possible. 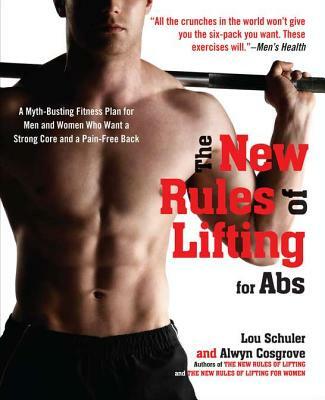 Lou Schuler, editorial director for T-Nation.com, is a National Magazine Award-winning journalist, certified strength and conditioning specialist, and author or coauthor of several popular books about diet and strength training, including Testosterone Advantage Plan, Home Workout Bible, Book of Muscle, and The New Rules of Lifting. He lives in Allentown, Pennsylvania, with his wife and three children.